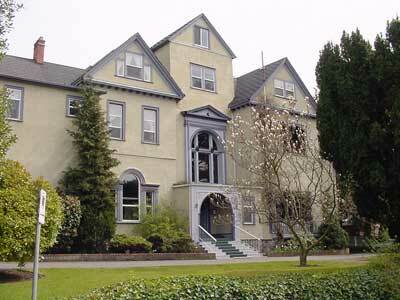 The Laurels is a large 2½-storey Victorian Queen Anne house with Classical Revival details. It has two pedimented gabled box bays above two hip-roofed angled bays on the Rockland façade and an entrance between the two bays. The front façade, on Langham Court, has two full-height, pedimented, gabled box bays. The gabled tower between the bays has a pedimented, round-arched window on the second floor with the flat-roofed entrance porch below. The left bay has a Palladian window with Ionic capitals on the main floor, the right bay has large sleeping porches with angled bays on each floor. The entire house is now stuccoed and has lost most of its detailing, although it retains its modillions under gable eaves. The foundation is fieldstone. Robert Ward owned this property until 1902. His brother was Bank of BC manager William Curtis Ward, who lived at Highwood (1021 Gillespie Pl). A small cottage stood on this property which was moved down the hill to 1261-63 Richardson St (Fairfield). The Wards lived in the cottage for 14 years before they had this mansion built. Robert was a commission agent who came to Victoria from England in 1871. In 1876 he married Mary Pauline King, daughter of Edward Hammond and Harriet King. He joined Welch, Rithet & Co, then Stahlschmidt & Co, importers and exporters. He eventually bought out that business and ran it as Robert Ward & Co. The success of his business allowed him to branch out into other areas such as insurance. In 1893 he built the Temple Building at Fort and Langley Sts, designed by Samuel Maclure. Robert, an active member of the BC Board of Trade, was president in 1887-91. He was also a provincial magistrate, a pilotage commissioner, and managing director of the BC Corporation. Robert retired in 1893 and returned to England c.1902 where he died in 1928. From 1903-12 this was the Collegiate School for Boys. Bishop Hills established the school in 1861 and it was moved several times before coming to this location, then moved to its final location in 1912. The first boys’ school in the province, it closed its doors in 1929. The children of key historical families, such as Helmcken, Tolmie, Flewin and Robson, all attended the school. John William Laing (c.1846-1909) was headmaster from 1893 until his death in 1909. He attained his MA from Oxford University and was a Fellow of the Royal Geographical Society of London. He came to Vancouver Island in 1896 and led an exploration party into the Island interior, correcting maps of lakes, rivers and other landmarks. In 1897 he married Ethel May Read (1866-1948), born in Toronto, who came to Victoria in 1896. After John died, Ethel married widower Charles Corbishley Bennett (1859-1944) in 1911. He was in the army, and retired as colonel in 1934. They lived in this house briefly in 1933-34. St. George’s School for Girls replaced the Boys School from 1913 until closing in 1928. Mrs. Hannah W. Suttie founded the school in 1907 in a small house on Yates St. The school opened with only five students, but was up to 135 students when located here. The school had a reputation for unusually high standards and was favoured by many prominent families. It closed because Hannah could not manage all the tasks involved with a residential school, particularly one in a house such as the Laurels, which required extensive maintenance. Hannah was also wheelchair bound because of rheumatism. She then joined the City’s teaching staff, and taught in a ground level classroom that was especially made for her. By 1931, this was known as Langham Court, and Mrs. M.K. Johnson was the proprietor. By 1937, this became the Rockland Lodge Rooms, later Apartments, which it remained for the next 20 years. Lucy Irene and William Shade were the owners until their deaths in the mid-1940s. William Shade (1877-1946) was a tugboat captain born in Burlington, ON. Lucy (Matthews, 1880-1947), born in Burgeo, NF, operated the apartments. It remains an apartment block.